The Circle class creates a new circle with the specified radius and center location measured in pixels Example usage. The following code creates a circle with radius 50px centered at (100,100)px. Defines the horizontal position of the center of the circle in pixels. Defines the vertical position of the center of the circle in pixels. Defines the radius of the circle in pixels. Defines parameters to fill the interior of an Shape using the settings of the Paint context. 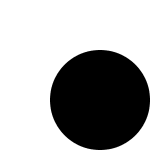 The default value is Color.BLACK for all shapes except Line, Polyline, and Path. The default value is null for those shapes. Defines whether antialiasing hints are used or not for this Shape. Defines whether antialiasing hints are used or not for this Shape. If the value equals true the rendering hints are applied. Defines parameters of a stroke that is drawn around the outline of a Shape using the settings of the specified Paint. The default value is null for all shapes except Line, Polyline, and Path. The default value is Color.BLACK for those shapes. Defines the array representing the lengths of the dash segments. Alternate entries in the array represent the user space lengths of the opaque and transparent segments of the dashes. As the pen moves along the outline of the Shape to be stroked, the user space distance that the pen travels is accumulated. The distance value is used to index into the dash array. The pen is opaque when its current cumulative distance maps to an even element of the dash array and transparent otherwise. An empty strokeDashArray indicates a solid line with no spaces. Defines a distance specified in user coordinates that represents an offset into the dashing pattern. In other words, the dash phase defines the point in the dashing pattern that will correspond to the beginning of the stroke. Defines the decoration applied where path segments meet. The value must have one of the following values: StrokeLineJoin.BEVEL, StrokeLineJoin.MITER, and StrokeLineJoin.ROUND. Defines a square pen line width. A value of 0.0 specifies a hairline stroke. Note that boundsInLocal is automatically recomputed whenever the geometry of a node changes. For this reason, it is an error to bind any of these values in a node to an expression that depends upon this variable. For example, the "x" or "y" variables of a shape should never be bound to boundsInLocal for the purpose of positioning the node. Note that boundsInParent is automatically recomputed whenever the geometry of a node changes, or when any of the following change: the transforms sequence, the translateX, translateY, layoutX, layoutY, scaleX, scaleY, or rotate variable. For this reason, it is an error to bind any of these values in a node to an expression that depends upon this variable. For example, the "x" or "y" variables of a shape, or translateX, translateY should never be bound to boundsInParent for the purpose of positioning the node. See the class documentation for Node for scene graph structure restrictions on setting the clip. If these restrictions are violated by a change to the clip variable, the change is ignored and the previous value of the clip variable is restored. A disabled Node should render itself differently to indicate its disabled state to the user. Such disabled rendering is dependent on the implementation of the Node. The shape classes contained in javafx.scene.shape do not implement such rendering by default, therefore applications using shapes for handling input must implement appropriate disabled rendering themselves. The user-interface controls defined in javafx.scene.control will implement disabled-sensitive rendering, however. A disabled Node does not receive mouse or key events. Specifies whether this Node should be a part of focus traversal cycle. When this property is true focus can be moved to this Node and from this Node using regular focus traversal keys. On a desktop such keys are usually TAB for moving focus forward and SHIFT+TAB for moving focus backward. By default the first focus traversable and focusable Node added to a Scene is to receive focus by default. NOTE: the current implementation of hover relies on mouse enter and exit events to determine whether this Node is in the hover state; this means that this feature is currently supported only on systems that have a mouse. Future implementations may provide alternative means of supporting hover. The rectangular bounds that should be used in calculations for both manual and automatic layout of this Node. By default, layoutBounds will be equal to the geometric bounds of the node and does not include the effect, clip, or transforms. Note that the layoutX, layoutY, translateX, and translateY variables are not included in the layoutBounds. This is important because layout code must first determine the current size and location of the Node (using layoutBounds) and then set layoutX and layoutY to adjust the translation of the Node so that it will have the desired layout position. layoutBounds is automatically recomputed whenever the geometry of a node changes. For this reason, it is an error to bind any of these values in a node to an expression that depends upon this variable. For example, the "x" or "y" variables of a shape should never be bound to layoutBounds for the purpose of positioning the node. Hook for node-specific layout information used by layout containers. Hook for node-specific layout information used by layout containers. If the node is not a child of a container which supports layout info, this variable will be ignored. Note that layoutInfo object literals may be shared across nodes, which means altering the vars in layoutInfo will affect all such nodes. Defines the X coordinate of the translation that is added to the transformed coordinates of this Node for the purpose of layout. Defines the X coordinate of the translation that is added to the transformed coordinates of this Node for the purpose of layout. Containers or Groups performing layout will set this variable relative to layoutBounds.minX in order to position the node at the desired layout location. Defines the Y coordinate of the translation that is added to the transformed coordinates of this Node for the purpose of layout. Defines the Y coordinate of the translation that is added to the transformed coordinates of this Node for the purpose of layout. Containers or Groups performing layout will set this variable relative to layoutBounds.minY in order to position the node at the desired layout location. Opacity is specified as a value between 0 and 1. Values less than 0 or greater than 1 are clipped to 0 and 1 respectively. The parent of this Node. If this Node has not been added to a scene graph, then parent will be null. The pivot point about which the rotation occurs is the center of the untransformed layoutBounds. Note that because the pivot point is computed as the center of this Node's layout bounds, any change to the layout bounds will cause the pivot point to change, which can move the object. For a leaf node, any change to the geometry will cause the layout bounds to change. For a group node, any change to any of its children, including a change in a child's geometry, clip, effect, position, orientation, or scale, will cause the group's layout bounds to change. If this movement of the pivot point is not desired, applications should instead use the Node's transforms sequence, and add a javafx.scene.transform.Rotate transform, which has a user-specifiable pivot point. The pivot point about which the scale occurs is the center of the untransformed layoutBounds. Defines the X coordinate of the translation that is added to the transformed coordinates of this Node. This value will be added to any translation defined by the transforms sequence and layoutX. This variable can be used to alter the location of a Node without disturbing its layout bounds, which makes it useful for animating a node's location. Defines the Y coordinate of the translation that is added to the transformed coordinates of this Node. This value will be added to any translation defined by the transforms sequence and layoutY. Returns true if the given point (specified in the local coordinate space of this Node) is contained within the shape of this Node. Note that this method does not take visibility into account; the test is based on the geometry of this Node only. Invoked by anything which may cause the boundsInLocal to change. Invoked by anything which may cause the boundsInLocal to change. We do it this way to avoid actually having to recompute the bounds (ie, if I put an on replace trigger on boundsInLocal, then it would force the recomputation of bounds in every case even in situations where we don't need to be computing bounds. This way we don't do that). Invoking this function will cause the entire chain of parent nodes to this node to be notified that their child bounds have changed, which may cause them to revalidate their bounds if somebody is listening to their bounds, or in the simplest case will just walk up the tree and notify that bounds have changed. Invoked whenever the effect has changed internally. Currently used only by Toolkit.createAnimationPathHelper(). Note I use a private variable / public function pair to avoid creation of a Location object and to prevent binding to the initialized variable. Some nodes require a special handling to request focus. Invoked whenever the transforms sequence changes, or by the transforms in that sequence whenever they are changed. Returns true if the given bounds (specified in the local coordinate space of this Node) intersects the shape of this Node. Note that this method does not take visibility into account; the test is based on the geometry of this Node only. The default behavior of this function is simply to check if the given coordinates intersect with the local bounds. Transforms a bounds from the local coordinate space of this Node into the coordinate space of its javafx.scene.Scene. Transforms a rectangle from the coordinate space of the javafx.scene.Scene into the local coordinate space of this Node. The function calcuates an interpolated value along the t between 0.0 and 1.0. The function calcuates an interpolated value along the t between 0.0 and 1.0. When t = 1.0, endVal is returned.